This weekend Maxime Martin managed to bring a win for BMW on the Norisring circuit in Germany after a break of over 25 years. However, as everyone expected, the race was full of challenges, old rivalries and unexpected turns. The one that took the cake though was with Audi’s Mattias Ekström and it showed us once again why we love the DTM so much. 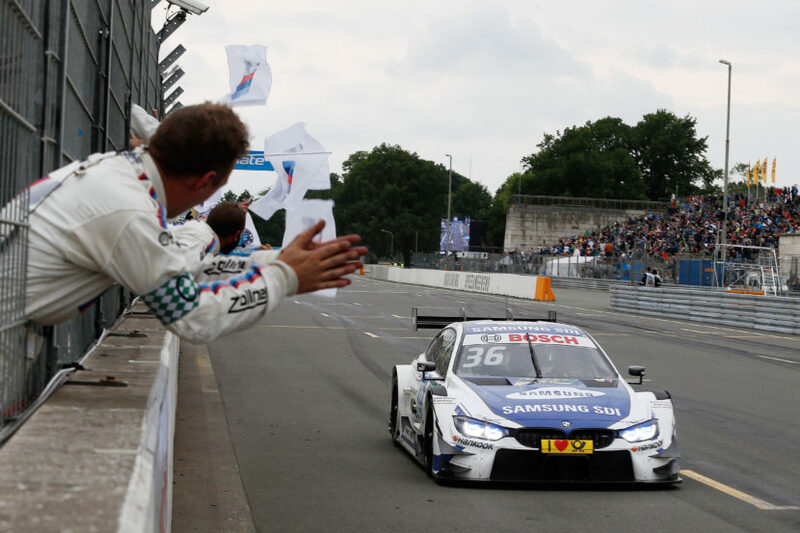 For BMW, the win was a fitting conclusion to a historic weekend at the Norisring. BMW was victorious in Nuremberg for the first time since 1992 – and, as was also the case back then, in both races. Marco Wittmann, Augusto Farfus, Tom Blomqvist and Timo Glock finished fifth, seventh, ninth and tenth to complete a fine team result, with five BMW M4 DTMs in the top ten on Sunday. Spengler came home twelfth, having been in contention for a podium finish for long periods of the race. Norisring (GER) 02nd July 2017. BMW Motorsport, Race 8, Winner Maxime Martin (BEL) SAMSUNG BMW M4 DTM. The strategy, and the rapid work performed byBMW Team RBM, allowed Martin, who came into the pits after lap seven, to climb through the field and join the battle for the lead. The safety car was called into action after 25 laps, following a collision between Mercedes driver Robert Wickens and René Rast from Audi. Martin and Spengler moved into first and second place after the restart. However, contact with another car that was yet to make a stop resulted in Spengler’s car suffering a puncture. Shortly after that, the race was suspended after a crash involving Gary Paffett from Mercedes and Mike Rockenfeller, Audi. After an interruption of around half an hour, the cars were sent back onto the track for the remaining 25 minutes. Maxime Martin led at the restart, with Wittmann third having climbed several places after the safety car phase. The exciting second half of the race saw Martin hold off Auer in the battle for the lead. The Belgian went on to claim the second win of the weekend for BMW. Wittmann came home fifth, just 0.027 seconds behind third-placed Edoardo Mortara from Mercedes following a dramatic finish with three cars crossing the finish line within millimeters of each other. The battles though were absolutely crazy, as you’re about to see. Next post Happy 4th of July, 2017!